Belina's Adventures: Let's Spend Some Time in...... Tlaxcala!!!!! Let's Spend Some Time in...... Tlaxcala!!!!! Living in Puebla gives us many alternatives for day trips (longer ones too), just taking into consideration our neighboring states (Veracruz, Mexico State, Tlaxcala, Morelos, Guerrero and Oaxaca!) plus adding the two major cities in the state of Puebla (Puebla the capital and Tehuacan) will offer so many interesting trips you will be busy exploring for some time! We're still trying to get the apartment into shape but after a while of doing this we were ready to go exploring (the apartment will keep after all and no sense getting into a rut, right?) so we decided to drive over to Tlaxcala, our neighbor to the North East (kind of) and get familiar with one of the loveliest areas around. Tlaxcala is relatively close to us and there's two roads leading there, one is the old (free) road, Highway 119 via Zacatelco and the other is Federal Highway 121 through Santa Ana Chiautempan. It's actually only about 40 Km away, so it won't take any time at all to get there. Here's a nifty little website you can use whenever you're planning a trip around Mexico, sponsored by the SCT (they are responsible for roads and highways and much more....) but it gives you beginning and ending destinations with roads, tolls, hotels and more. But let me tell you about what's in Tlaxcala: There has been settlers there since 12,000 bc, so plenty of ruins and historical monuments; lots of Pre-Columbian history and even though they were surro unded by the mighty Aztec empire, they were never conquered and they were bitter enemies. As a matter of fact that is one thing they've always had against them, they worked with Hernan Cortez and against the Aztecs and to this day are labeled traitors for siding with the enemy. But in the end they met the same fate as everyone else after Cortez failed to keep his promises and destroyed their templ es, took their women and made them all Cristians. This was in 1520. Due to Cortez setting up his center of operations there, the first Catholic Baptistry was here as well as the first County government, giving Tlaxcala the first Capital city status. The highest peak in Tlaxcala is the extinct volcan o La Malinche. The Náhuatl named it Matlalcueyetl, which means woman with the blue skirt. The state's most popular bullring, named after a famous bullfighter, is the Jorge "El Ranchero" Aguilar plaza; the 18th-century building is located in the historic center of Tlaxcala. 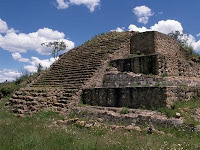 The largest bullring in the state is the Monumental Bullring of Apizaco. Huamantla's bullring, La Taurina, offers the added attra paper puppet in a coffin, representing bad moods. The puppet is then burned, along with dark pieces of paper symbolizing anger and sadness. 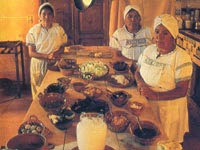 Xochiquetzalli, the Náhuatl goddess of fertility, is honored with a celebration every spring in the town of Huamantla. Alfombras de flores, or carpets of flowers, are arrayed in the central plaza. The carpets are made from thousands of flowers woven together, forming patterns as large as 30 square meters (320 square feet). The first Saturday after August 15, the state celebrates La Huamantlada, the running of the bulls similar to the tradition in Pamplona, Spain. Around noon, 12 angry bulls are set free on the streets, and hundreds of participants spend the next two hours running in front of them. Finally we come to the food of Tlaxcala which being in the center of Mexico offers a unique mix of the old and new. We find drinks made out of the agave plants "pulques" in all flavors called "curados" which is pulque mixed with fruit flavors. Strong, yet flavorful. These are often used in cooking as well lending their original flavors to many dishes. In the center and south of the state, maiz tamales are held in great esteem for their anis and bean flavors, Turkey Mole, Festive Mole, "Mole de Olla" and Mole Prieto as well. You can also find the famous "Tlacoyos" made from a mixture of maiz and potato or broad beans, "Escamoles", another high delicacy from ant larvae (yes, my husband loves these too! ), and Huitlacoche Quesadillas, which is known as Mexican Truffles and being a corn fungus that grows on the corn stalks and has a sweet corn taste but a black color. Wonderful in sauces and in tacos. (Filete de Res con Salsa de Huitlacoche, mmmmm). I guess you get the idea, the food is amazing and there are so many wonderful dishes in this region you would be surprised, but instead come to Tlaxcala and enjoy the wonderful weather (due to a mountainous area, cool weather is the rule plus offering all the sports that this would permit as well as varied outdoor activities).... friendly locals, archeological sites, historical monuments and buildings, colorful customs, a heavy bullfighting history and wonderful food. Luckily for us it's close by so we will be sure to come time and time again during the festive periods during the year and take advantage of the local festivities too! We live in Tlaxcala about 3 months every winter from mid January to mid April or so and love it. The weather has been a little warmer and warmer earlier the past two years. The people are wonderful and helpful. We especially enjoy the Zócalo because it is often the scene of dancing and singing. Sometimes such activities are also going on behind Saint Joseph's church (the plaza of the fountains).